A completely frivolous post based on a pleasant find at a local antiques/emporium shop. 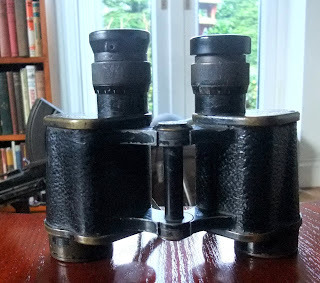 I came across an unusual (to me anyway) small pair of binoculars in a leather case marked up as an old pair of military binoculars - 2.5 x 50 according to the case. The binoculars had the War Arrow so I took a chance and purchased them for £18. On getting home a search on the Web revealed they were binoculars of the old Galilean design, manufactured in 1944 (the binoculars are not marked with a date or manufactures stamp, but the leather case had the traces of an old label, which when removed revealed the following: CAT No VF 2507 J.B.B 1944). 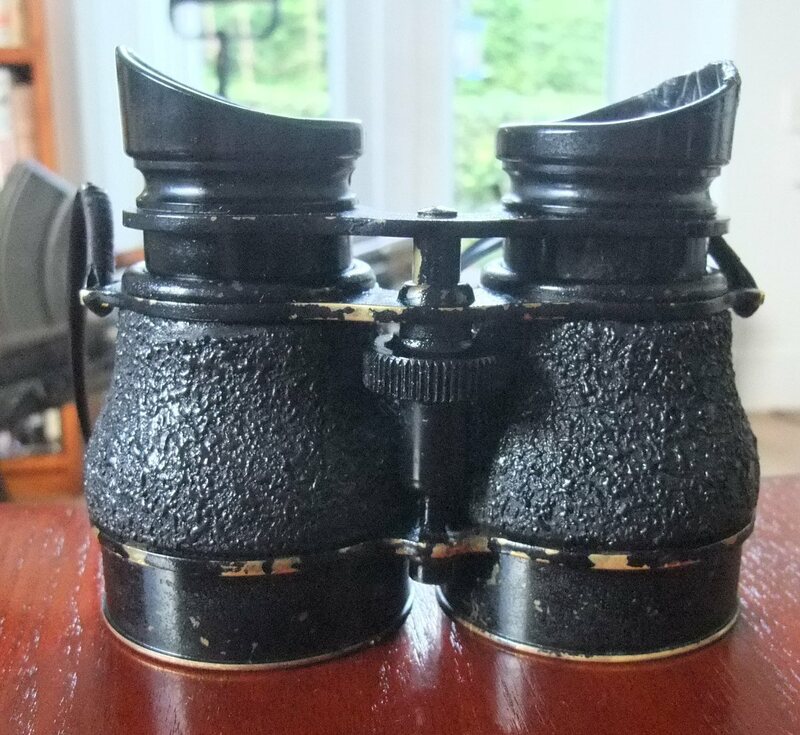 The searches on the net would appear that military dealers are all claiming these are 'rare' binoculars issued to airborne forces - largely as far as I can ascertain based on one well circulated image - see below. Prices ranged from £125 - £200 plus!! Had I obtained a bargain!? I don't think so, I finally came across a reference suggesting they were widely issued to all Combined Operation type forces, although if you are lucky enough to come across a pair with Air Ministry Markings, I think these are quite rare. Also given the day I searched on the Web there were at least four for sale, this alone would suggest they are not that rare despite the ridiculous price tags some dealers are asking. The binoculars cannot be altered at the bridge to suit particular faces. They are very compact and appear to be of a high build quality, the body being brass with Bakelite eye cups and focus wheel. Anyway I still wondered what use any military personnel could find for a pair of binoculars that only offered 2 1/2 times magnification. 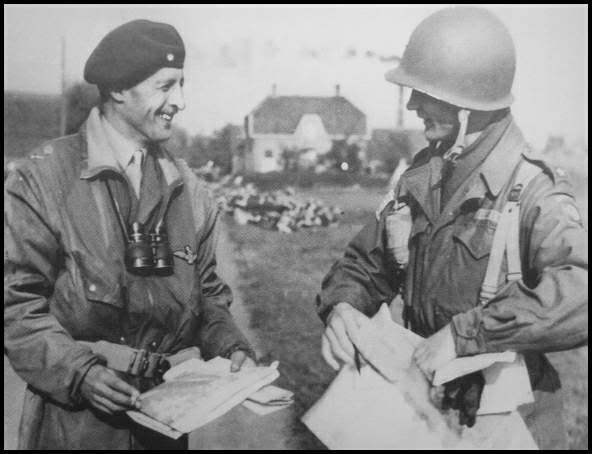 These particular Galilean binoculars were supposed to have been issued to paratroopers and pilots because of their light gathering capacity and compact size. 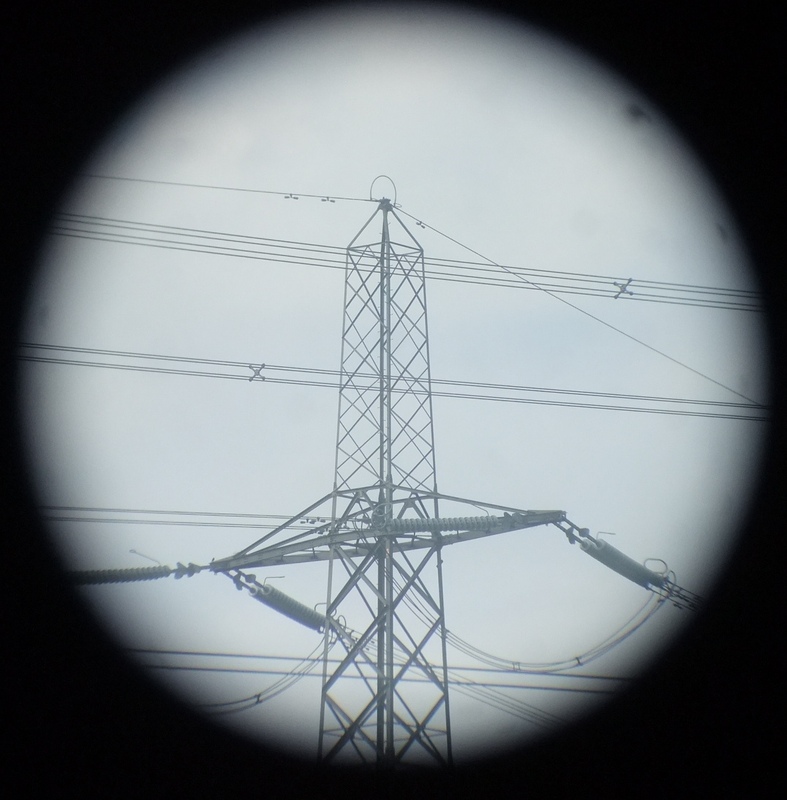 As a general rule the light gathering capacity of any binocular can be compared by dividing the magnification into the lens objective size. So for example a modern 8x32 gives a relative value of 4 (32/8) which would be as bright as a 10x40 but not as bright as a 10x50. So these Galilean should be very bright at 2.5x50 which gives a relative value of 20! - although I must admit I don't know if this principal can be directly compared with prism and Galilean designs of binoculars. As well as being apparently bright these Galilean binoculars also boast a wide filed of view - 10 degrees. Most binoculars today can only offer between 5 - 8 degrees. So my curiosity was now aroused - how would these binoculars perform? A test in daylight, comparing these with my 1941 pair of Taylor Hobson prism x6 binoculars, seemed a good idea! As suspected the low magnification seemed to offer only a slightly better view than the naked eye - if I was an infantryman in 1944 I would have much rather relied upon my Taylor Hobson's! The results of the test can be seen below. 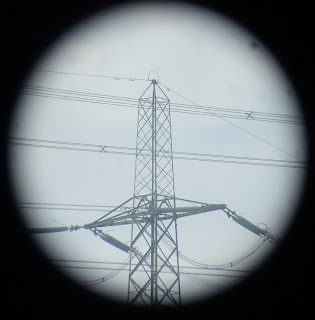 The above images show the wider field of view of the Galilean Binoculars but much clearer detail shown by the higher magnification of the Taylor Hobson's. 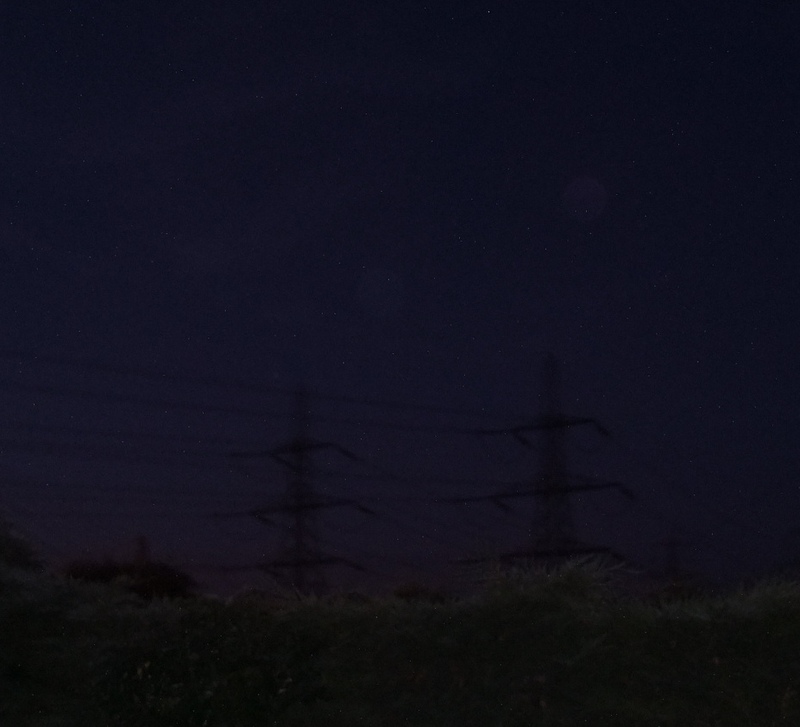 Next test was to compare the two at night (approx 10:30 pm). 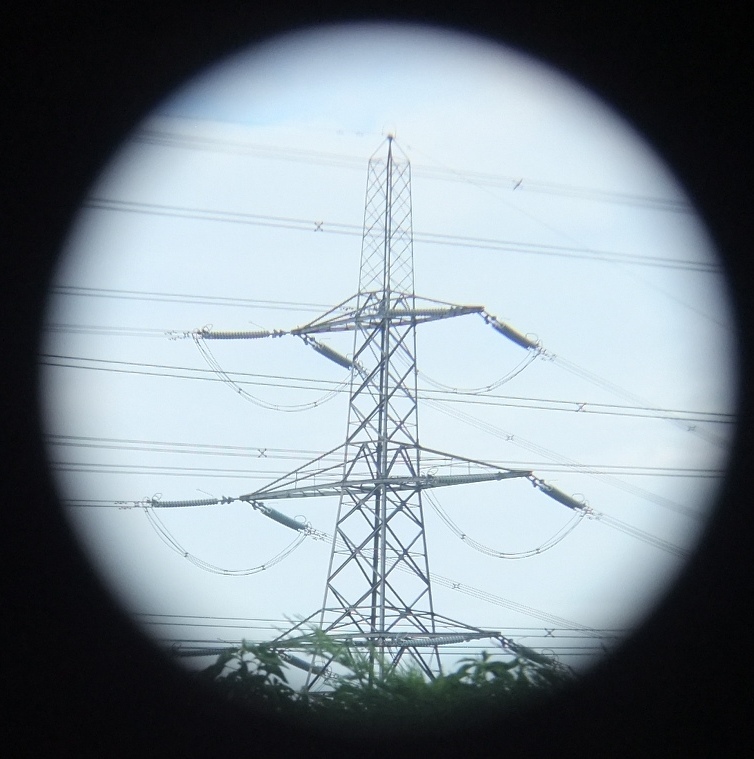 The photo below shows the image of the pylon in darkness but it was too dark to repeat the 'through the lens images' as shown above. You will have to take my word for it - this is where the Galilean's really performed and is no doubt the reason they were supplied to Combined Op's forces. The performance in darkness was truly amazing. If I was an infantryman in 1944 often operating in darkness I would much rather have relied upon the Galilean's!! Conclusion - I don't think I paid £18 for a pair of binoculars worth £125 plus, but probably a fair price. But the real enjoyment is browsing around antique shops/emporiums and once in a while coming across such a gem - certainly makes the day! 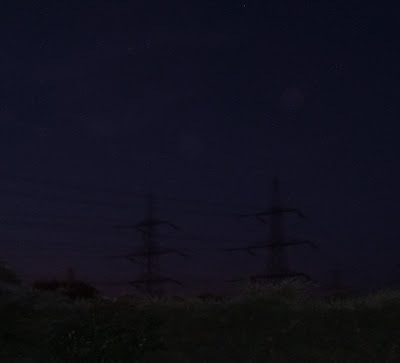 Bentwaters part 3 to follow shortly.